At the north end of the Las Vegas Strip stands one of the Las Vegas' most iconic landmarks — Stratosphere Hotel, Casino, and Tower. 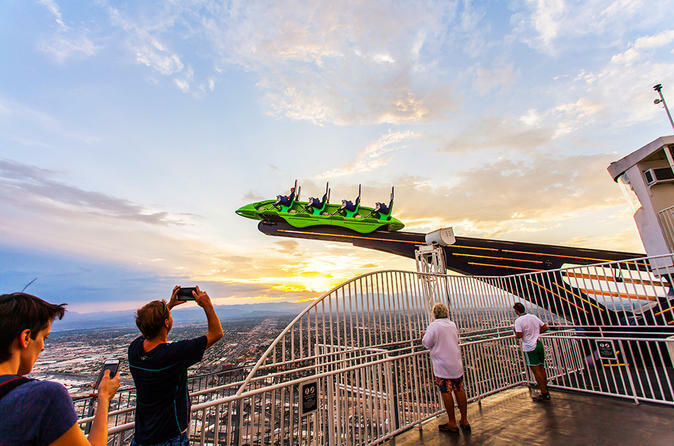 Take the high-speed elevator up more than 100 stories to the 1,149-foot (350-meter) Observation Deck, the second-tallest freestanding observation tower in the western hemisphere, where you'll access the three rides that are part of your Stratosphere Unlimited Ride Pass. X-Scream is a 27-foot (8-meter) catapult over the edge of the tower that leaves you dangling weightlessly 109 stories in the air. On Insanity, a giant mechanical arm holds you 900 feet (274 meters) above the Strip and spins you 64 feet (20 meters) over the edge of the tower. The Big Shot blasts you 160 feet (49 meters) straight up in the air from the top of the tower, providing a G-force experience as you freefall back to the launchpad. If this isn't enough adrenaline for you, upgrade to the SkyJump and descend to Earth at speeds up to 40 mph (63 kph) from 108 stories above the Strip.